The days are growing shorter, which means chillier evenings in our neck of the woods. Kat often enjoys an early evening walk to hear the wind rustle through the dry leaves, and count the emerging stars. Don’t worry, I always remind her to bring a hat and scarf! 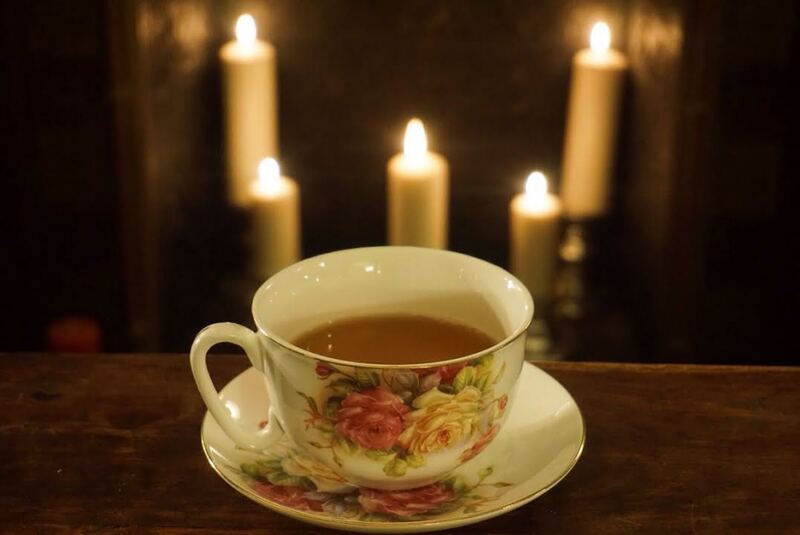 When she returns from her brisk walk Kat is ready for the perfect warming tea. Of course I’m here to deliver! We’ve discussed evening teas before, but there is an additional way that Kat and I relax and warm ourselves. A cuppa by the fire! It doesn’t get much better than holding a mug of tea while listening to the crackle and pop of the fire. Warmth emanates from the fireplace and continues with each sip of tea. With the right teas to steep and the smoky, warm fire, we feel as if we are sitting in a log cabin in the woods. One of Kat’s most favorite teas to sip by the fire is Wegman’s Cinnamon Spice Black Tea. Kat discovered this tea at one of her book clubs meetings. The group discussed a story that took place in Switzerland in the wintertime, and they sipped this tea as they talked. Kat told me the tea gave her a warmth that shined all throughout her body. The tingle of cinnamon, hum of cloves, and hint of orange grabbed Kat’s attention. She went out to the store right after book club and brought home a box. When I steeped it up I felt that soothing cinnamon warmth right down through the edges of my saucer! A warmth to melt the most arctic evening. Since Kat loves to re-create her favorite teas herself, she decided to craft her own cinnamon spice blend. This blend can be made with or without black tea. Crush a whole cinnamon stick, and 4-5 cloves. Kat likes to do this with a mortar and pestle, but you can easily put the ingredients in a zip top bag and crush with a rolling pin. Add the mix to an infuser basket, paper filter, or right into the cup. Pour boiling water over the spices and let steep for at least 5 minutes. You can add loose tea or teabag of your choice, or go without tea altogether. A dash of honey or maple syrup can be added if you’d like a bit of sweetness. Even if you don’t have a fireplace of your own, drinking a warming tea on a chilly night will bring you right to that log cabin in the woods. What teas do you reach for when the sun sets and the temperature starts to dip?